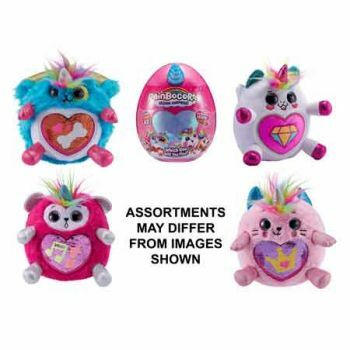 "From the new Disney Junior series, Vampirina, comes a Spook-tacular new hero named Vampirina â€“ a girl vampire whoâ€™s new in town and learning how to fit in while also being true to herself.Â The Bat-tastic Vampirina doll celebrates a fang-tastic best friend, who may look different, but is just like you!Â Press Vampirinaâ€™s necklace to hear her say fun phrases from the show! Uh-oh! 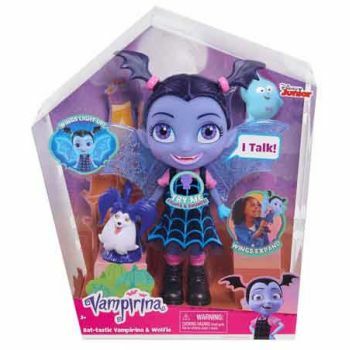 Looks like Vampirina has a """"Case of the â€œBattys!â€ Hear bat-tastic sound effects as she â€œswoops,â€ â€œloopsâ€ and â€œfliesâ€ around with her boo-tiful light-up bat wings!Â Vampirina comes with her loyal pal, Wolfie, and is dressed in a spook-tastic web-detailed dress with matching necklace."